Today we’re going to have a look at a game from 1989. It’s called Dogs of War and was developed by Vectordean. These guys brought us the James Pond series back in the days, but also titles like Fire and Brimstone and Bad Company. The game was published by Elite, one of the major software houses of the 1980’s. Dogs of War is a straight-forward shoot’em up that doesn’t pretend to be something else. From the minute you launch the game, you’ll be hitting the fire button of your joystick like a crazed madman in your attempt to survive the oncoming onslaught. There are thousands of different shoot’em up’s available for all kinds of platforms. How does Dogs of War compare to these? Does it have something special to offer? Let’s go and find out. 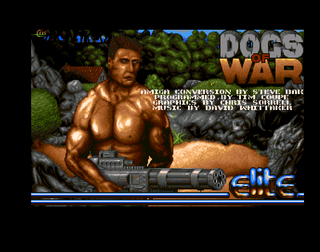 Dogs of War kicks off with an animation of an Arnold Schwarzenegger type character that wields a huge Minigun. 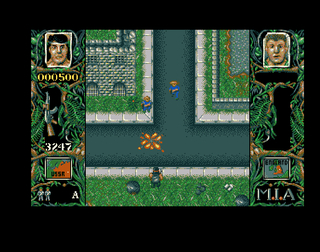 The game then proceeds to a menu where you can choose either one or two-player mode. If you select the latter, two people can play simultaneously. 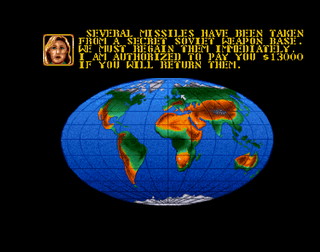 After you’ve made your choice, a map of the Earth appears on the screen. It contains several blinking spots, each of them located in a specific country. These spots represent the different missions of the game. As a mercenary, you must finish all of them to complete the game. In reward for completing assignments, you’ll receive money, which you can use to purchase better weapons in the in-game shop. When you’ve selected your mission, you’ll reach the in-game shop. On this screen you’ll get detailed information concerning a wide range of handheld firearms. 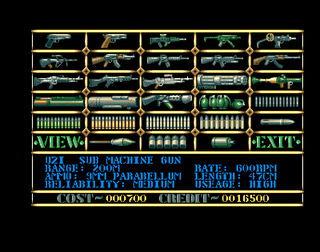 Rate of fire, type of ammunition and range are specified for each weapon. You can buy famous weapons like the UZI submachine gun, the AK-47 and of course the American M-16. 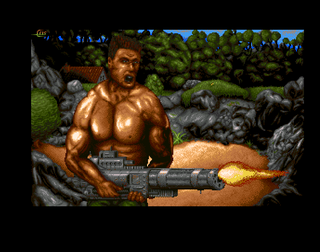 When you’ve saved up enough money, a Minigun is not out of the question. The guns are not cheap, so consider carefully how you spend your money. The controls are easy to learn. You can move in all directions (up, down, sideways) with your joystick. To fire your gun, you simply press the fire button. Since Dogs of War allows the player to have a big arsenal of weapons, you must use the keyboard to change between them. This can be challenging in hectic situations which requires 100 percent focus on what’s happening on the screen. The maps are big and it will take you quite a bit of time to get through them. Each map is different from the other when it comes to terrain, soldiers, vehicles and vegetation. The graphics are OK in general and I don’t have anything to criticise here. The music on the other hand is a bit repetitive and can get boring after a long gaming session. The problem is that there is only one song. Even if it’s good, you get tired of listening to it again and again and again. Completing a level is hard. You only need to get hit by a bullet once to hit the dirt. If you accidentally bump into a foe you’ll perish as well. 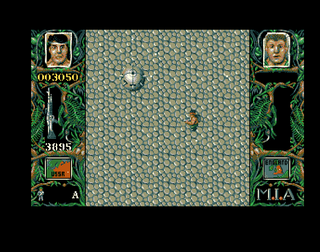 Sometimes the screen is almost covered with bullets and enemies, which is very challenging. After some practice, you should be able to even out the odds a little bit, but Dogs of War is no doubt among the tougher shoot’em up’s out there. As mentioned previously in this review, there are many different missions to choose from. You’ll get the opportunity to save the world from evil or rescue P.O.W’s. Good stuff! Does Dogs of War have something to offer compared to other shoot’em up’s? I believe so. The weapons selection screen, the wide range of missions available and the feeling that you are building up a character like in a role-playing game is quite special. I want to emphasize that Dogs of War is nothing close to a role-playing game, but it’s just the feeling I get when playing it. Apart from this, the game is like most other shoot’em up’s. You avoid fire, you return fire, you triumph or you fail. All in all I think Dogs of War is a fine shoot’em up. It’s not the best one out there, but it’s got both playability and atmosphere. I love the in-game shop and the possibility of selecting which mission to take on next. The two-player mode is also a big plus. Two negative aspects are the level of difficulty and the music. If you enjoy shoot’em up’s, you should definitely give it a try. I have spent a lot of time on this game. I really like this kind of game. I always remember TIMBO and F5 (correct?) for the cheat mode. If you like this game you also would like Leatherneck.